Modern Coast Express Ltd, one of the largest and leading Bus Company in Kenya and East Africa will soon be launching its new route to Goma. Goma is a city in the Eastern Democratic Republic of Congo (DRC), located on the Northern shore of Lake Kavu, next to the Rwandan city of Gisenyi. The route will begin from Nairobi City, passing via Kampala to Goma. For those travelers and entrepreneurs of DRC, thumbs up, Modern is here to sort you up. No more travel worries to Goma and Nairobi. 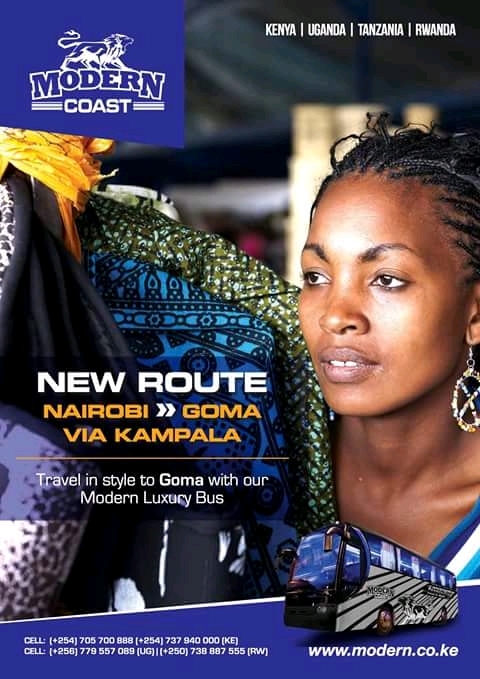 For inquiries and bookings to Goma, kindly visit any Modern Coast office to inquiry on the official date of the route launch. Modern Coast, Travel in Style..